Cairo and Washington signed an MoU last month to impose tighter restrictions on the illicit importation of Egyptian antiquities. Egypt’s Ministry of Foreign Affairs repatriated on Monday five late pharaonic-era artefacts which had been smuggled to, and recently recovered in the US, General Supervisor of the Antiquities Repatriation Department Shabaan Abdel-Gawad told Ahram Online. 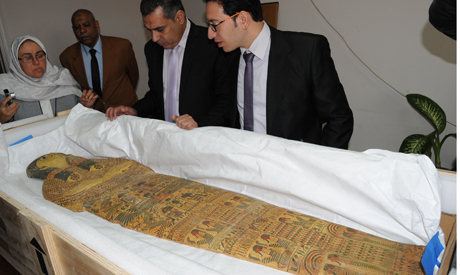 Minister of Antiquties Khaled El-Enany expressed his full appreciation for the efforts of the ministries of foreign affairs and the interior in collaboration with the Ministry of Antiquities and foreign authorities to repatriate the objects and protect Egypt’s cultural and archaeological heritage. Abdel-Gawad said that the objects recovered include a wizened mummified hand, a painted child’s sarcophagus, a gilded mummy mask, the lid of a wooden sarcophagus decorated with religious scenes and a painted linen burial shroud. In early December, Egypt signed a Memorandum of Understanding (MoU) with the United States to impose tighter restrictions on the illicit importation of antiquities from Egypt. According to the MoU, the US government must return to Egypt any material on a designated list of antiquities which are recovered and forwarded to Washington. Abdel-Gawad said the US government will continue to provide technical assistance in cultural resource management and security to Egypt, as appropriate, under existing and new programmes. This article was copied from english.ahram.org.eg. 2017-01-10 in Destruction of Cultural Heritage, Illegal excavations, Selling of unprovenanced items.